Birdland Diaries: Day 12 | Katarina G.
Today was one of those strange days during which I felt like everything was going very smoothly and we were totally nailing it and I had relatively little to do, which felt great, and yet … we were pushing the generosity of our host at the studio a little far. We were supposed to be out of his hair by 10pm, but we pushed it to nearly midnight and I spent the last two hours of the night feeling terrible even though he was being very gracious and accommodating. We managed to get through an ambitious 30+ pages in three days – nothing to scoff at. The studio time definitely helped us pick up speed, and our host’s willingness to be taken advantage of a little toward the end was deeply appreciated. But still, it was one of those “if we hadn’t had leeway about our end time, we would have been screwed, and that is an important lesson to learn” type of days. I feel like I’ve learned that lesson about a dozen times in 12 days, if not more. I know I’m not saying anything revolutionary, but it can be very difficult to balance the needs of the actors, the crew and the director all at the same time, because those needs can be radically different – even competing, and that can slow things down quite a bit. In this case I was also trying to remain mindful of our host, a (pretty brilliant and very generous) working artist whose work and home space we were imposing on. Of course, he’s the director’s good friend and I didn’t need to worry that he would kick us out or that a friendship would be actually ruined, but when someone looks like they really want to go to bed because you told them you’d get out of their home two hours ago and you’re still there, it’s hard not to feel uncomfortable – on behalf of yourself and the entire crew. I know we have a couple of days coming up when we truly won’t have any leeway about location in and out times, and that does worry me. My friend Jeff posted this article about locations-related lessons learned on an indie shoot, and it could not be more timely. I’m gonna have a book’s worth of “lessons learned” to talk about when I’m done this sucker. 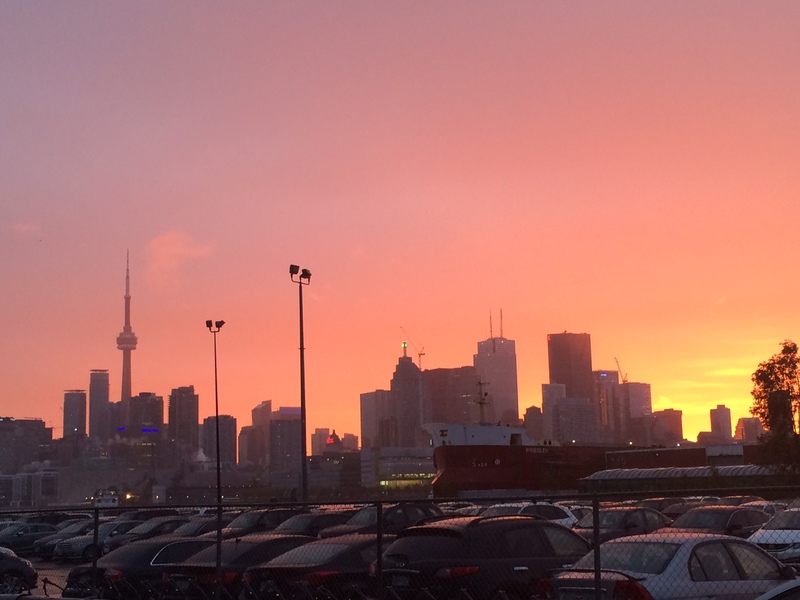 Those minor hitches aside, on day 12 I managed to get a lot of planning work done for the next few days and I witnessed a really gorgeous sunset (me and everyone else in Toronto). So, it was a raging success as far as I’m concerned.